Lyme disease is a commonly misdiagnosed bacterial illness caused by Borrelia burgdorferi (B. burgdorferi), generally passed through the bite of ticks, but perhaps also through other biting insects. Lyme disease is the most commonly reported vector-borne illness. The CDC reports that in 2010 there were 22,572 confirmed reported cases of Lyme disease last year in the U.S. Over 1,100 of these cases were in Maryland. The CDC estimates that the prevalence is 7.3 cases per 100,000 in the US. The true prevalence of Lyme disease is not known as many cases go undiagnosed, but is estimated to be 3 to 5 fold higher. The highest incidence is in children aged 2 to 15, and adults aged 30 to 55. Lyme disease is everywhere: it is found in every state in the country. In Maryland, deer ticks carrying Lyme disease are everywhere, particularly on or near Maryland's Eastern Shore. (Conversely, there is only a handful of annual reports of Lyme disease in Baltimore City.) Still, many Maryland doctors do not realize how widespread the disease is and often dismiss patient's concerns and reject Lyme disease as a potential differential diagnosis. A review of history with the patient may not always include recent travel by the patient which may have increased the patients risk for exposure. Further, patients may not be aware that they have been bitten by a tick. In fact, it is estimated that only 15-50% of patients recall being bitten by a tick. Ticks inject a substance which anesthetizes the host so that a bite is not felt. Proper diagnosis of Lyme disease is critical because treatment is most effective if detected early. In some cases, the patient may have a "bull's eye rash" near the bite or elsewhere on the body. In these cases testing is not necessary. The presence of a "bull's eye rash" only occurs in approximately 50% of cases. Further, many rashes are not in a typical "bull's eye" pattern and may be round or oval and range in color. Pustules may or may not be present. Size also ranges between 5cm to greater than 250cm. Due to the variations in the presentation of the rash, it may be diagnosed as a spider bite, cellulitis (a bacterial skin infection) or tinea corposis (a fungal skin infection). 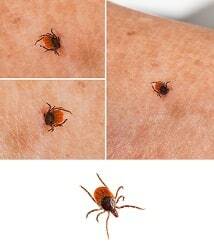 Patients may present with headache, stiff neck, body ache and/or fever subsequent to a tick bite (which the patient may or may not be aware of). In some cases these symptoms may be mistaken for a flu or illness. Lyme disease should be suspected in cases where a tick bite is known, even without the presence of a "bull's eye rash". Lyme disease symptoms also include double or blurred vision, fainting, dizziness, chest pain, painful joints, loss of coordination, paralysis and memory loss. When the symptoms of Lyme disease are caught quickly, a 10-to-28-day course of treatment will cure up to 95 percent of human patients without serious side effects. But for a minority of patients, it can lead to potentially life threatening meningitis, arthritis, nerve and heart damage, and other long term complications if treatment is delayed. If a doctor is not on top of his/her game, Lyme disease is easy to misdiagnose. Sure, there are laboratory tests with scientifically reliably sounding names - western blot and ELISA (enzyme-linked immunosorbent assay) - that are used to try to detect Lyme disease. But the Lyme disease blood tests are not reliable and can cause more harm that good in detecting Lyme disease because the tests sometimes yield false negative results that throw doctors off the scent of other consistent symptoms. False negatives may occur due to the timing and extent of the infection or antibiotic use which suppress antibody production thus limiting circulating antibodies below the limit of detection of the assay. Many doctors don't know that Lyme disease tests may be wrong and, as a result, may order tests at the wrong times, and may rule out a Lyme disease when negative results are received. So this requires doctors that understand the Lyme disease and appreciate that it can only be diagnosed clinically based on symptoms. If Lyme disease goes undiagnosed (this goes for both humans and animals), the infection may spread to the brain, joints or other tissues. The disease can surface immediately or remain dormant and may progress in the future, up to months or even years later. The disease may surface due to a patient's weakened immune system in response to stress or other factors which may compromise the immune system. Due to the possibility of the disease remaining hidden for years, a tick bite at any point in a patient's history is important for proper diagnosis. As any human body system can be targeted, patients can suffer from an array of symptoms and complications. Lyme disease should be suspected when a patient suddenly suffers from anxiety and panic attacks, tremors, memory loss, attention deficit or other neurologic symptoms. Common misdiagnoses include anxiety, chronic fatigue syndrome, OCD (obsessive-compulsive disorder) depression, fibromyalgia, multiple sclerosis (MS), Meniere's disease, Parkinson's, Lou Gehrig's disease (ALS), early-onset Alzheimer disease, viral syndrome and others. In children it can be misdiagnosed as ADHD, ASD and learning disabilities. Clearly, getting Lyme disease does not mean you have a misdiagnosis medical malpractice case. But there is no question that the harmful effect of Lyme disease could have been stopped in whole or in part by a correct and prompt diagnosis. If you believe you may have a medical malpractice claim, call 800-553-8082 or get a free online medical malpractice consultation.